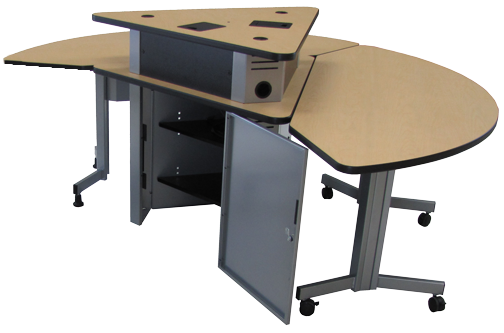 Spectrum Industries, Inc., designer and manufacturer of educational technology furniture including lecterns, desks, and laptop/iPad/tablet carts, is now bringing its expertise to furniture for collaborative classrooms. The latest of the InVision Collaboration Line is the InVision Active Learning Pod System™. The Pod consists of three mobile tables that combine with a technology pedestal that can securely house AV and collaboration technology. 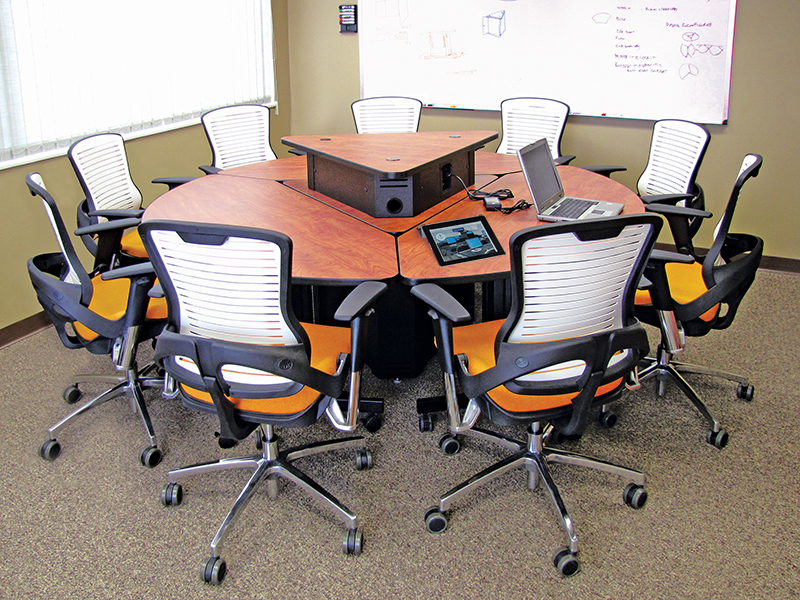 “Like the other products in the InVision Collaboration Line, the Active Learning Pod System keeps the cost of sharing down,” said Scott Dorn, vice president of sales and marketing, Spectrum Industries. “A well-crafted three-section round table surrounds the heart of the collaboration; a technology pedestal." The roundtable encourages interactive communication for up to nine adults. Each table seats three adults and has one ADA-compliant position. 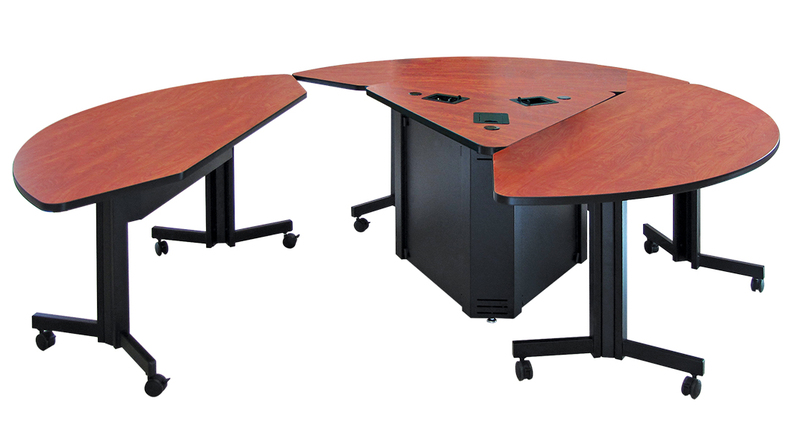 The tables come with both glides for stationary seating, and casters for added mobility. With the optional modesty panel, the tables can easily be used away from the technology pedestal for breakaway study groups. The mobility also makes it easier to move the tables for access to the technology in the pedestal. The stationary, three-sided, steel pedestal has a durable powder coat finish. Inside the pedestal are two shelves to accommodate your choice of AV and sharing technology. The vented pedestal aids natural chimney-effect cooling. A locking door keeps investments safe, yet allows easy access for integration. The triangular worksurface has scratch and impact-resistant laminate. 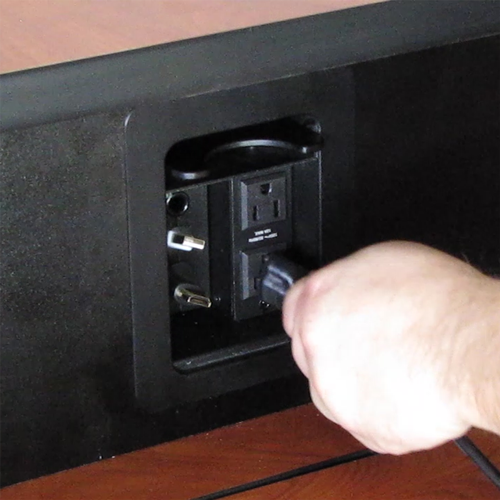 Add cubbies for access to electricity and communication plugs. Cutouts can be added to the worksurface for cable cubbies for power and communication connections. Optional risers with three customizable panels give more options for technology controls and connections. The release of the Active Learning Pod System to the InVision Collaboration line is just in time for summer purchase and integration. Additional information can be found at the Spectrum Web site.